Pictured are members of Gallipolis FFA at the Farm Science Review in London, Ohio. 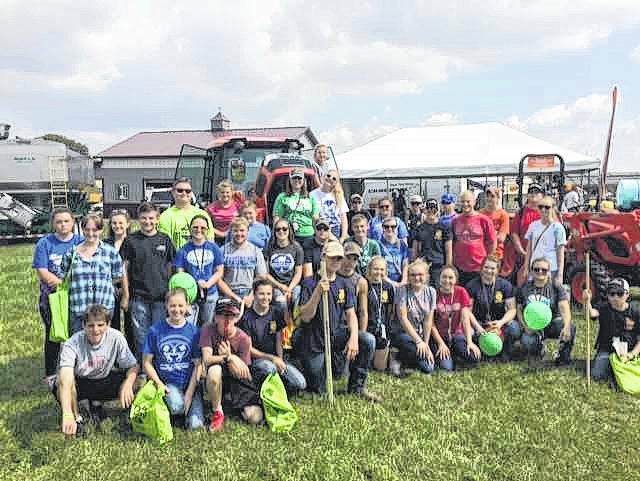 Thirty-seven members of the Gallipolis FFA Chapter recently attended the Farm Science Review in London, Ohio. While there, the members had a chance to see all the new science and technology used in agriculture today. There were over forty acres of educational booths and exhibits relating to animal science, plant science, and agricultural mechanics. They also got to spend some time with state soil scientists at the Gwynne Conservation Area. The members that attended were Bella Bonzo, Cody Brumfield, Braiden Burnett, Dakota Cadle, Makenna Caldwell, Josie Cremeans, Tristin Crisenbery, Jayla Davis, Coen Duncan, Taylor Facemire, Abby Fitzwater, Caleb Greenlee, Kyle Greenlee, William Hendrickson, Derek Henry, Nelida Hernandez, Kayla Huffman, RJ Huffman, Kirsten James, Carley Johnson, Dallas Johnson, Kyley Jones, Abby Jordan, Brittany Masters, Ethan Mayes, Jonas McCreedy, Cadha McKean, Ashleigh Miller, Trace Neal, Erin Pope, Carissa Queen, Obie Reeves, Kenedie Roush, Adrianna Sanders, Cassidy Starnes, Riley Starnes, and Jamie Steger. The group was accompanied by FFA Advisors: Jerrod Ferguson and Katherine Dickson.